Diggers Valley: 20 January 2007. The week beginning the 20th of January 2007. I spent several hours this afternoon wandering around one of the larger, bush-clad paddocks, hunting for ragwort. I am still pleasantly surprised to find myself in places I've not been before - in the middle of a stand of trees, it's quite hard to see where you are in relation to everything else, so the new view may only be a few metres from another, better known spot. 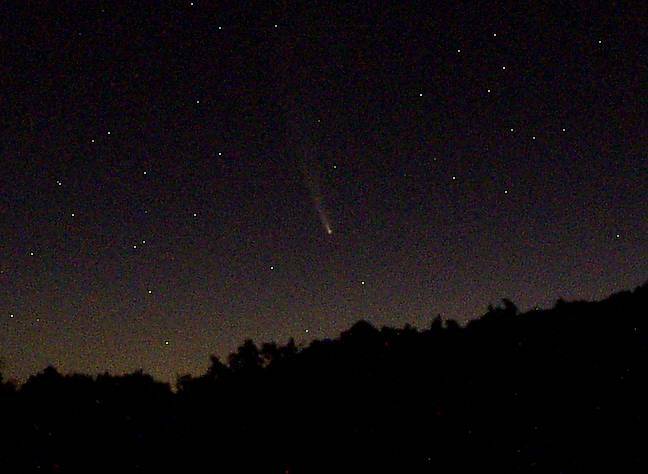 The McNaught Comet is smaller this evening and there are too many clouds to see it clearly for long. The comet is getting fainter every time we see it, as well as shifting around to the south in our sky. If you think the white spots are not stars, you're probably right. I suspect the camera made them up but since they look very much as the real ones did on the night, I didn't try and remove them all. I wasn't going to use this photo, except when I had a closer look, I was struck by the hills in the background and the focus on the large trees across the flats. I'm not sure why it was quite so hazy - probably a bit of drizzle on the day. 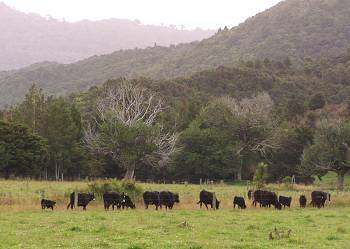 The cattle are the large mob with #26 bull, moving from the Camp paddock out around to the Bush Flat paddock which is behind all the trees, off to the left of the picture. Out the back of our place, accessed via another winding, unsealed road, lives (periodically) a woman I met a couple of years ago, with whom we've become friends. On one of her visits during last year we'd said we'd help her sort out her water supply, since she presently has to rely on her neighbours, yet has water welling up out of the hill behind her house. Having heard she was about to spend the weekend at her place, we thought we'd better do something about that undertaking, which we'd forgotten in the mean time, in the usual busy-ness of our own lives. 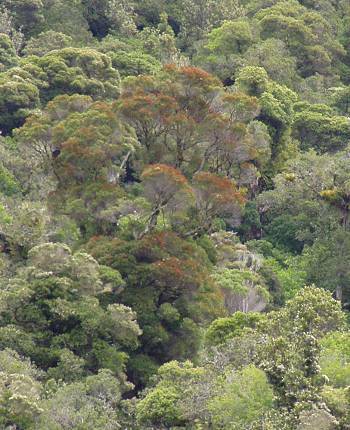 Up in the bush I spotted a couple of the big Northern Rata trees in bloom - they're not terribly spectacular this year, either for climatic reasons or because possum numbers have built up again. I haven't seen a really good show of them in the bush around here for a few years, despite the possum control (poisoning) programme of a few years ago.